The unlucky few of us have the tricky dilemma of being cursed with weird names. My name, hypothetically not weird at all, landed me in a situation where a cool costume idea was required, beginning with my initial. And that initial was O. What costumes begin with O, I hear you ask? Believe me, I exhausted Orange, Oompa Loompa and in my desperation, looked into Optimus Prime. None of these ideas, however original, inspired me much. Until I landed myself in the biscuit aisle and was hit by the iconic black and white cookie cream logo. And that was that. 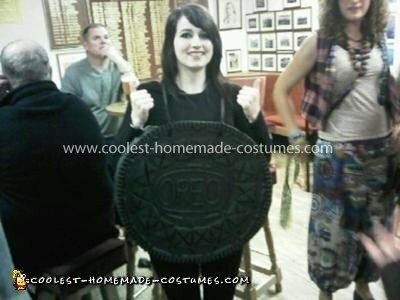 It took me a week to make my Oreo Cookie Costume, being quite the perfectionist, but a simple version can be knocked out in no time. 1.) Cut out two big cardboard circles to whatever the size you want. I went as big as my torso. 2.) Glue supports along the outside in between them to fix them in place. Remember to steer clear of the middle, where your body will fit. I used old kitchen roll tubes. This will provide the support for the ‘cream’ as well. 3.) Papier mache the details of the biscuit on the front. Print out a picture or use an actual Oreo for reference. 4.) Paint everything a dark browny/black. 5.) Wrap white paper tissue round and round the cardboard supports. You should end up not being able to see your body inside the biscuit. 6.) Puncture two holes on both sides at the top parallel to your shoulders and thread and tie black ribbon/string from one hole, over your shoulder to the opposite hole. 7.) Slide it over you head and let the ribbons rest on your shoulders, holding the costume up. Wear black clothes underneath and you are a bona fide Oreo.